Split, enamel scraped, nodes attended to and ready to start looking like piece of a rod. When showing someone the rod making process, it’s the transition of an 8ft long, 3inch around stalk of bamboo and transforming it into equal triangles 1/16th its original size that provokes the wide eyed look. Once the culm is spilt, sawed or hacked into smaller rectangular sections you have to turn those into triangles that will lay in your planning form. Rod makers do this a number of different ways. Rough spilt strip, bevelled strip. Once we visited Jim Downes he showed us another option. Jim ran his strips through Bellingers Little Giant rough out beveller. I immediately knew I had to have one of these machines. Square or rectangular strips are fed into the machine cutting both sides of your triangle in one pass. 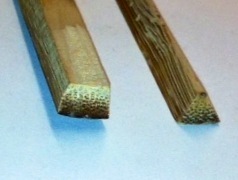 The bed is then continually raised to take off the desired amount of cane. Awesome machine, but as an amateur rod maker the price was out of my range. This machine also takes some criticism due to the cost of getting the unique cutting bit sharpened. So I began researching. 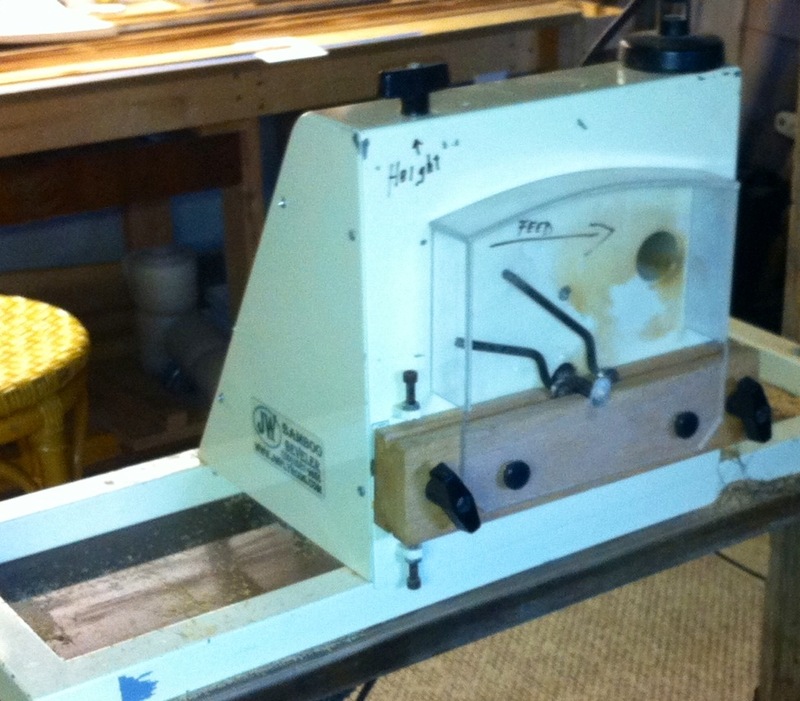 Most guys make a variation of this machine using a router and fabricating a bed. For about 300 bucks you can make your own beveller. Typically called a Medved style, which will cut one side per pass. So you send strip through, raise bed, flip strip and cut the other side. . Basically takes two passes to get what the Bellenger machine does in one. 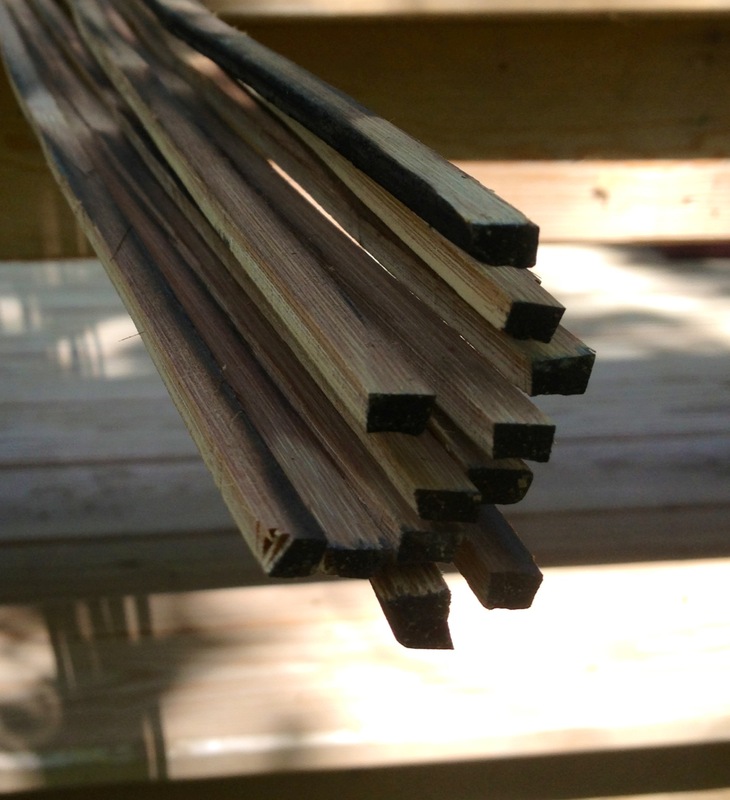 From the beginning of this journey the old man and I had decided we didn’t want to waste time on making our tools, we would do our best to purchase what we could from reputable sources. So I did what I always do when the next shiny item sparks my interest. Started selling off my fishing gear to finance the purchase. I came across a JW rough out beveller. Extremely similar to all the homemade medved type bevellers but classy as hell. I had found the machine used on a popular bamboo rod website. Before making my purchase I contacted the maker of the machine. I believe his name is Jerry, I honestly forget. What I do remember was his awesome customer service and the time he spent with me on the phone knowing I’d be purchasing a used machine, he would be receiving no business from me. He explained the usage, materials and construction. He was extremely helpful, and I pulled the trigger. I cannot recommend this machine enough. It cuts clean, fast and efficient. If you’re not lucky enough to find one lightly used they can be had new from http://www.jwflyrods.com/ for a price that is still half of the bellinger machine. If anyone has questions on the machine feel free to ask. 2 Responses to Roughing it.